3 species of whales: the False Killer whale, the Pilot whale and the acrobatic Humpback whale that can measure 15-17 meters (49 to 56 ft.) in length and migrates to tropical and subtropical waters during our winter season - whale watching is simply beautiful! 5 species of dolphins: the Spotted dolphin, the Spinner dolphin, the Bottlenose dolphin known as "Flipper", and the Common Dolphin. It is sometimes posible to see orcas. 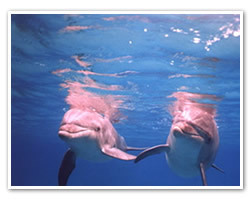 The Humpback whale and all dolphin and whale species are endangered and protected in Costa Rica. In the case of the Humpback whale, there aren't many individuals left in the whole world. There are several half day whale and dolphin watching tours available in the area of Dominical, Uvita, Ojochal and Costa Ballena. Come join us and learn more about them, and love them even more. 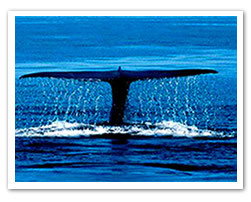 Surely the whale watching tour will be an unforgettable experience!